Throughout the Old Testament, God is highly concerned about tribal issues, government, wars, and the capture of land for his chosen people, including the taking of slaves and property from the surrounding tribes. Everything is focused on this life on this planet, with no concerns about an afterlife or the existence of any eternal consequences. But all of this changes in the New Testament. Now God is no longer concerned about politics, petty rules, land, wars, or anything related to the particulars of this life. Everything is focused on a second life that is to come after this one. He teaches his followers to eschew the material aspects of this life, to not marry, or accumulate possessions. The earthy life is seen as nothing more than a test for entry into the next one. 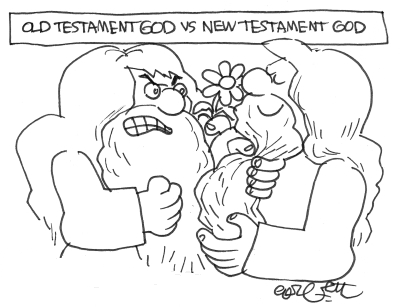 It is more than obvious that the god of the Old Testament is not the same as the god of the New Testament. This disconnect is not a solvable problem for Christianity. If the god of the Old Testament is fictional, then the god of the New Testament is also fictional, but there is no reasonable means to conclude that they are both factual. Because of this dependency, the mathematical conclusion is that the god of the Old Testament might be true, but the god of the New Testament is definitely false.